I see that silly man Jon Mills has been wasting his time again, giving a talk to those pesky kids down the road. Stop trying to peddle your wonky metalwork Mr Mills…. littering the countryside with your scrap….bah! Mr Watt, were you always grumpy or was it being forced to do sport at school that made you grumpy? From Caroline: Hi Mr Watt, what are your true feelings about blogging and the current trends towards being transparent as a human being? Do you think it might affect your ‘particular’ … as we know… ‘grumpy’ nature and your views on the meaning of life? Mr Watt replies: True feelings? TRUE FEELINGS? Transparency? I can see right through that nonsense. From Sophie: Welcome to blogging Mr Watt, lets see if you can make that go wrong too. 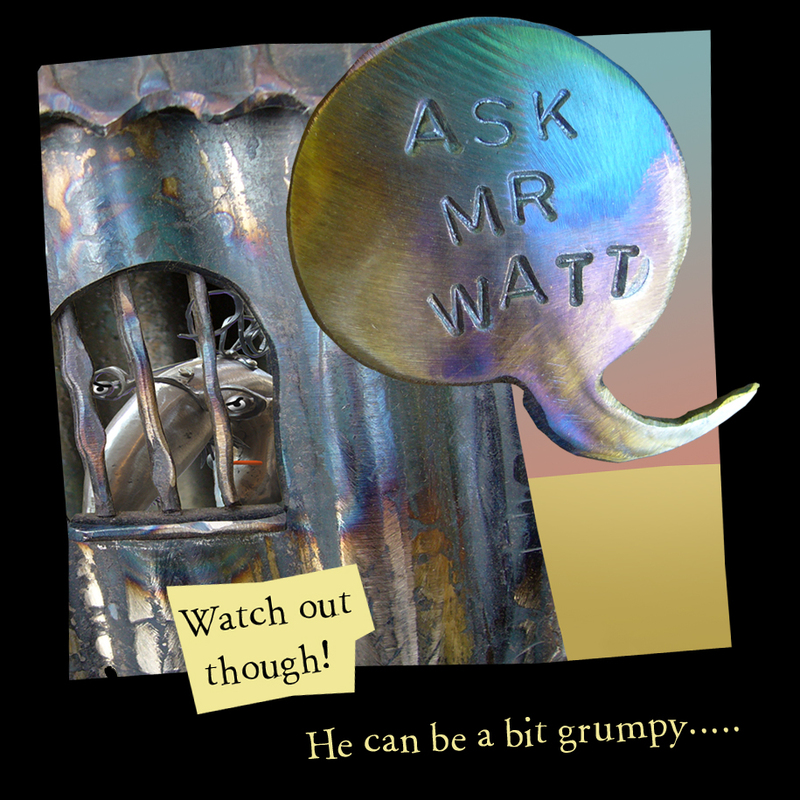 Mr Watt replies:I most certainly will.. what it needs is a jolly good spanner in the works. From Ian: Mr Watt, are you grumpy about having to publish electronically? Mr Watt replies: Bah! I will be using a new app… app-oplectic…. From Kate: Mr Watt, you have run the race, overcome many hurdles, swum with sharks, is it time for the high jump? Mr Watt replies: “Sport is a waste of time and should be thrown into the long grass”. Discus. From John: Mr Watt ~ what’s your favourite type of screw? Unified National Coarse? British Standard Fine? Is there one you could recommend? Mr Watt replies: Nuts and bolts can be such a wind up… My recommended thread? BA h! of course. British Association – an almost obsolete thread which strangely seems appropriate: a fine thread for the discerning nut.